One thing that has helped me a lot financially for years, is the fact that my kids and I enjoy "canning" our own food. If you know how, you can take a chicken breast, a portion of mixed vegetables, cover it with chicken broth seasoned to taste and can it in a special jar where it will keep for ten years without refrigeration. I have been canning my own food for more than twenty years and there are a couple of points I would like to add and/or emphasize. 1. If you are not exactly the most fastidious person in the world, if your kitchen is not the cleanest place, home canning is not for you. This is seriously dangerous - you can easily "can" your own poison, killing yourself and your family. 2. The other side of that coin is, some of the "directions" out there are evidently written by lawyers determined to make sure nobody could possibly kill themselves, no matter how filthy their canning environment. If you follow their pressure/time recommendations, you'll kill any filth and bacteria you put in the jar, your food won't be dangerous, and it won't be fit to eat either. 3. DO NOT use jars (like mayonnaise jars) that were not specifically made for the purpose unless you are "bath canning" tomatoes - even then, I wouldn't recommend it. 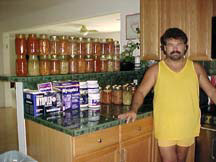 I have several hundred canning jars, some of which are probably twenty years old. The jars aren't expensive and you can reuse them forever. 4. NEVER, EVER, reuse a lid. They cost just a few cents each - this is a really dangerous thing to do. You can kill yourself and your children trying to save a few pennies. 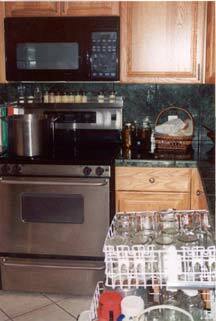 My kitchen is immaculate and I use the recipes that my aunts, great-aunts and grandmothers used for generations. The food is healthy, delicious and convenient. I can select soup, chili, beans-n-ham, stew . . . whatever, warm it up in the microwave and serve it in less than ten minutes. 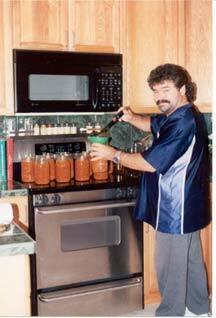 In our fast food culture, home canning is a dying art - it's a shame as it is incredibly practical. You cannot buy chili anywhere that is mostly meat, but you can make it at home however you like. I can everything in quart jars - with four kids, canning in pints is a waste of time. For those of you who may be considering home canning for BfL purposes, a pint is about right for a meal and pint jars are readily available anywhere you can buy quart jars. 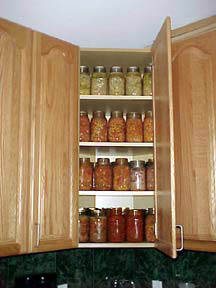 Whatever your reasons, home canning is practical and efficient and a great thing to do with the kids. You can make food that is better than anything you can buy in a store and it will keep for years on a shelf without refrigeration.